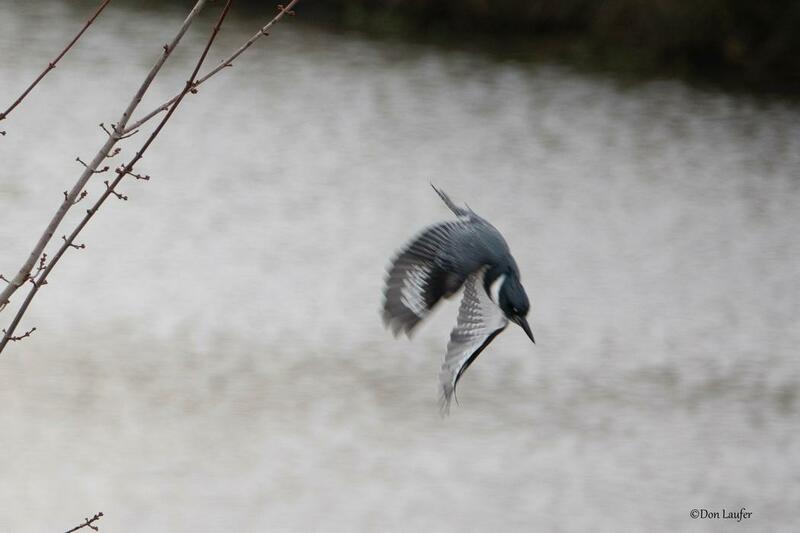 Bird list for bird walk at the Checkermallow wetlands area. The weather was cloudy, dry, with a cold wind. Why so many people? Not because it was 40 degrees I'm sure. People came in spite of it being 40 degrees. But they may not have realized there was also going to be a steady chilling wind the entire time we were out there - nearly two hours. It seems like there is a kind of "family" feel to our group in the Fall. 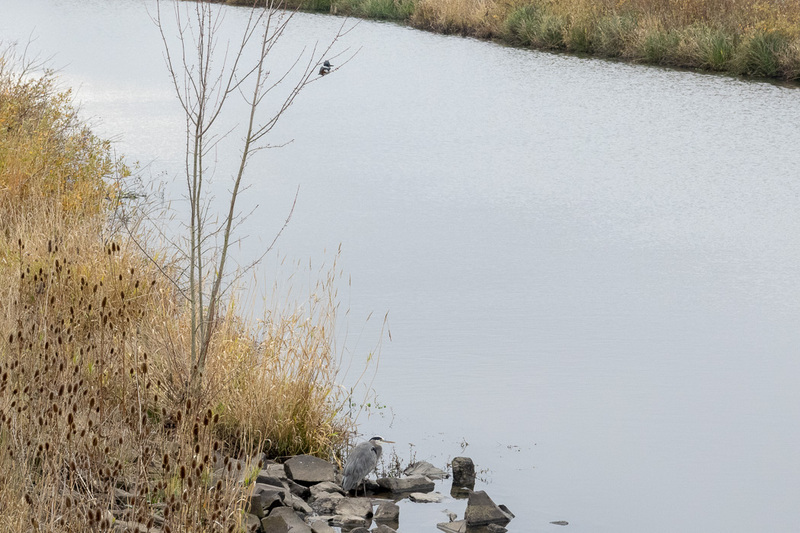 Maybe it's like that all year, but my sense is that people do more re-connecting and sharing in the Fall, especially the first few bird walks. And this group, in 40 degree weather with a stiff breeze seemed happy if not almost jovial. That wasn't all in my head was it? I went around and spoke briefly to close to half of these people. For an introvert, (not that there's anything wrong with that) that's pretty outrageous. I think because I seem to be well liked by BOGS members, I'm more comfortable just going up to people and starting conversations than I've ever been in any other social situations. It wasn't always like that for me here. 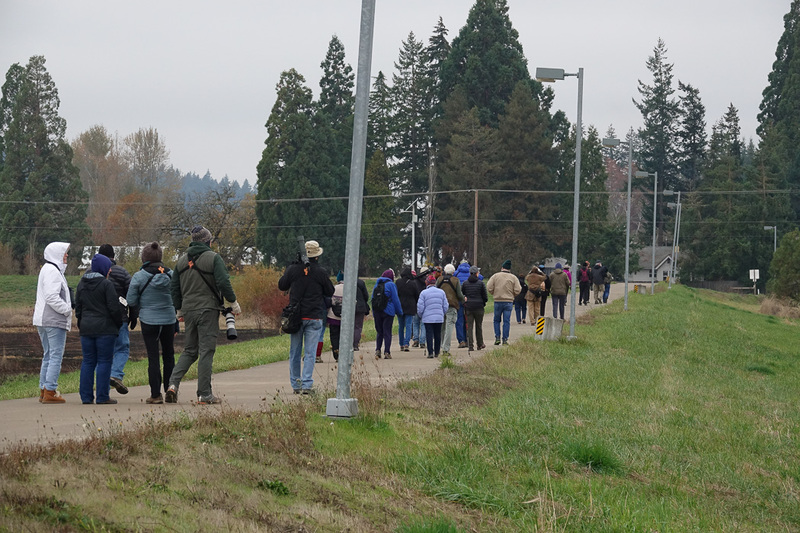 (I joined in March 2012, and my first field trip was actually this very same location: Checkermallow Access / Meadowlark Prairie. I saw my first Say's Phoebe that day, on a fence right near the parking lot). My first year in BOGS, I made some efforts to connect with people on the bird walks, but it seemed most people were already in groups of 2 or 3, and that makes it harder for me. I'm mostly a 1-to-1 kind of person. If a conversation involves more than 3 people, I'm hopeless and I stop talking. It was only after I starting taking photographs and putting them online that people seemed to become more more approachable for me. My BOGS social world was transformed. I know that extroverts get kind of high on being with other people. I've read about that and have certainly seen it. But it's only been a few times that I can remember having that kind of experience. And I was "high" all day after this bird walk. 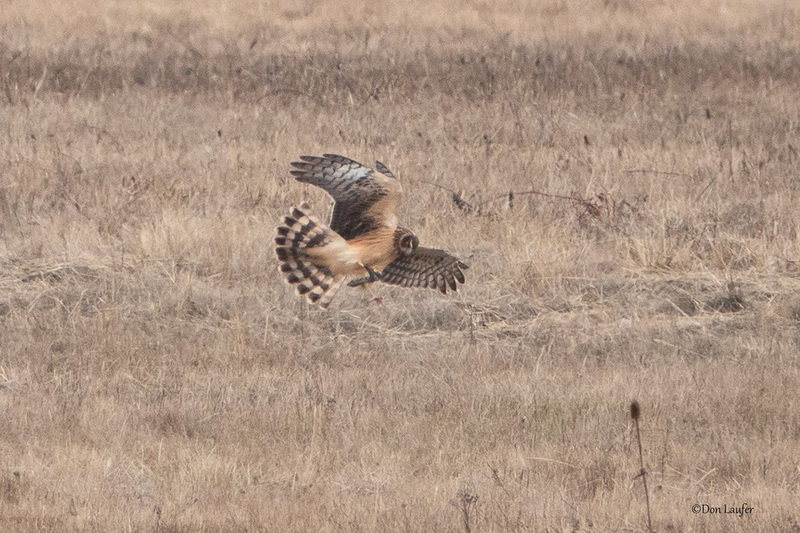 So it wasn't just the Rough-legged Hawk. Let's see 30 people divided by let's say 3 per car would be 10 cars. Hmmm ... we had almost 20 cars so they averaged 1.5 people per car. 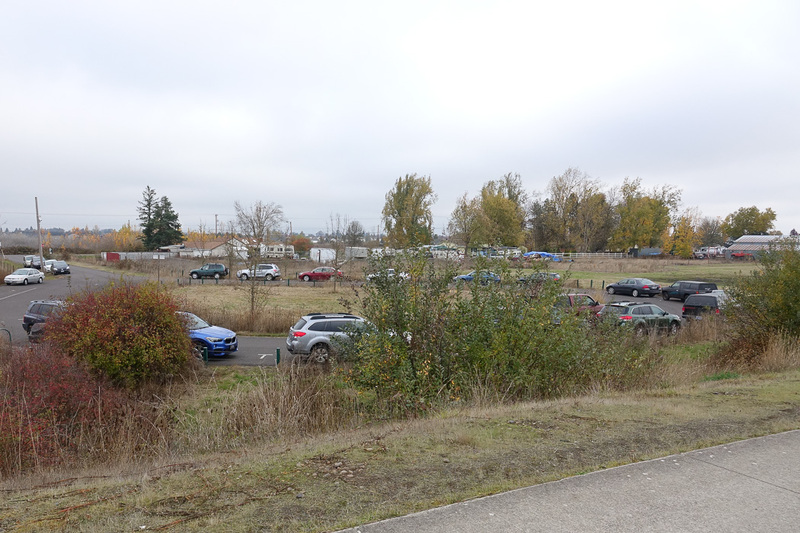 We urge people to car pool but our efforts are undermined by the fact that for west Eugene and also east Springfield destinations, the Campbell Center is much further away for them than driving directly to the birding location. They save some gas and some time, by going directly to our destination. Suppose 10 of the 30 drove by themselves for this reason, though it was probably more like 15. If 10 drove alone, then 20 people were in the other 10 cars, which is 2 per car. If 15 drove alone, then 15 people were in the other 5 cars which would be 3 people per car. One of these last two scenarios is probably pretty close to what happened. 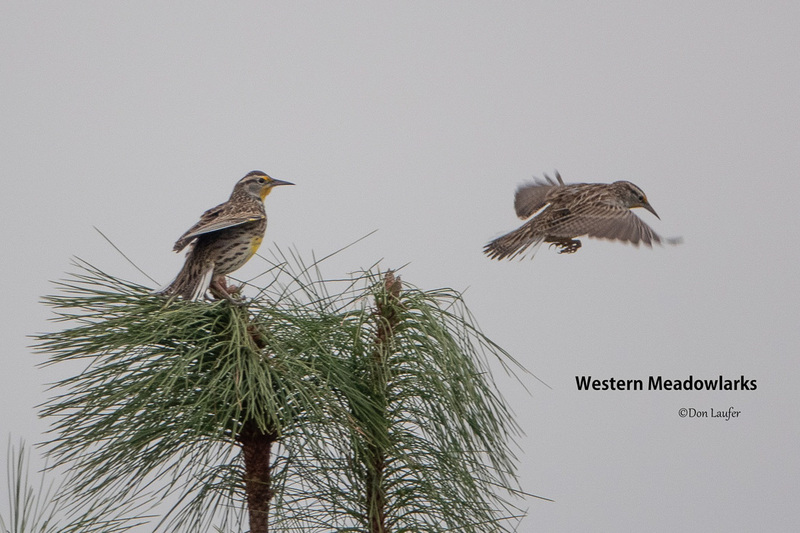 Upon arriving some of our group saw a flock of Meadowlarks which I guess promptly flew off. 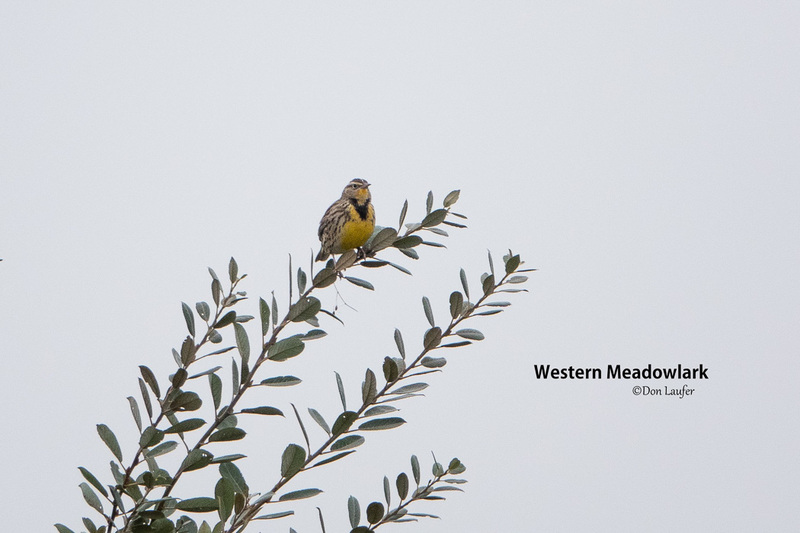 This place is the most reliable place for Meadowlarks that I know, certainly in Winter and Spring, if not year-round. 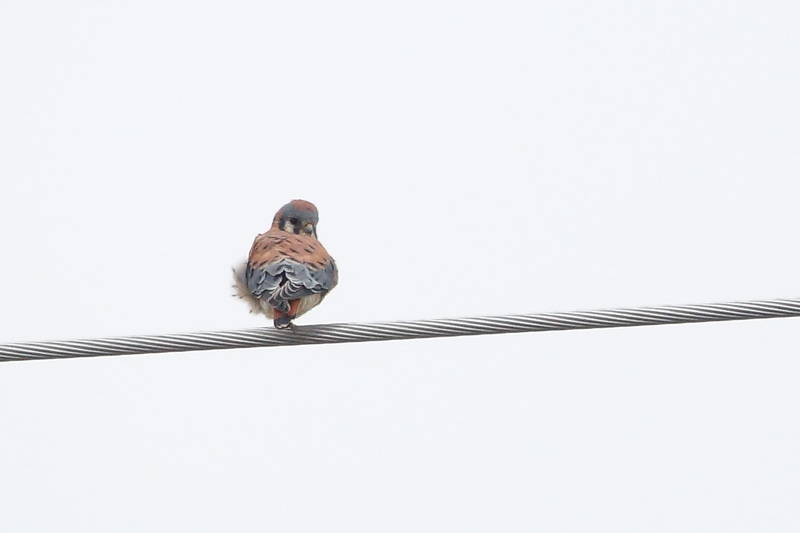 The first bird I saw which was close enough for an interesting photo was this American Kestrel. To show you what we faced out there, trying to identify birds; here's what some of the far-away birds looked like without any (camera zoom). 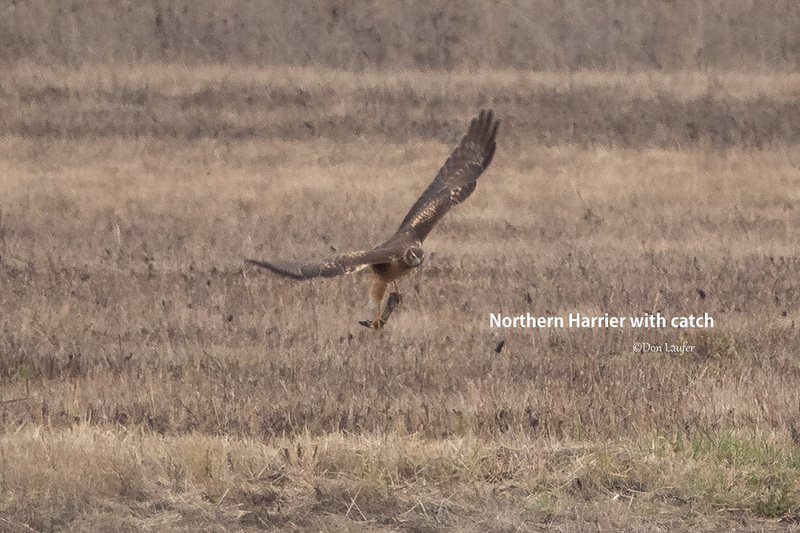 First is a Northern Harrier flying. 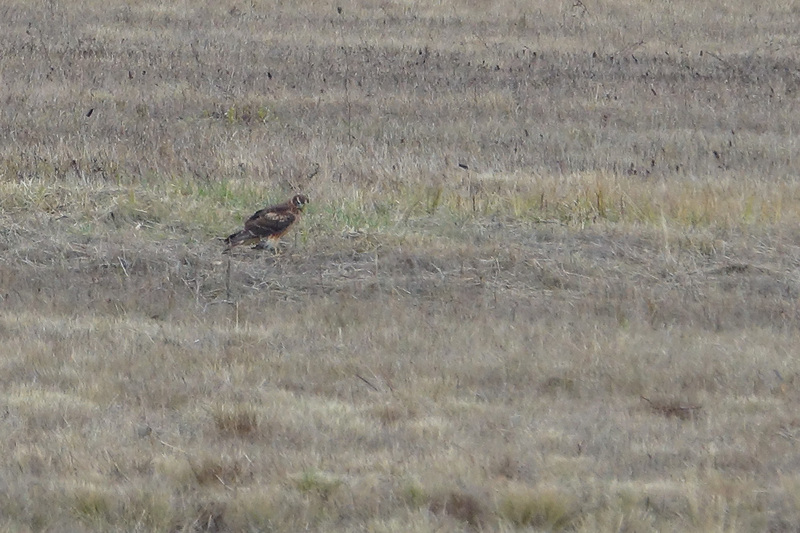 Next is a Northern Harrier on the ground in the grass. 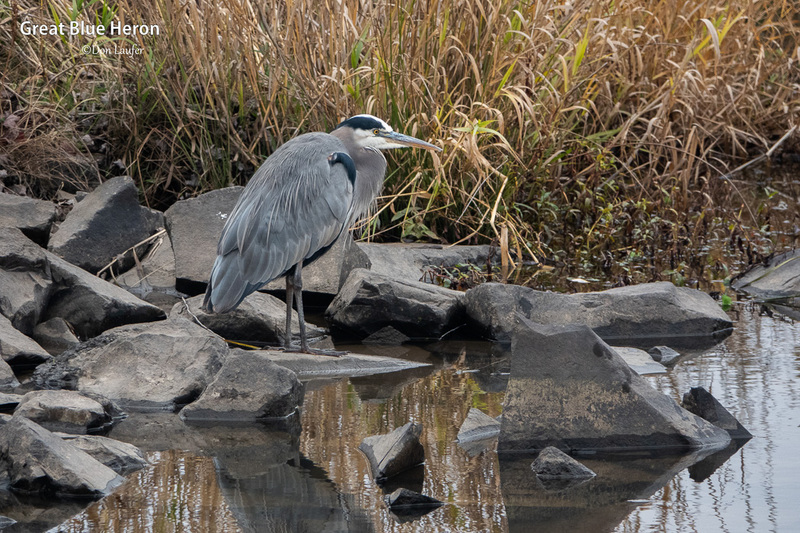 While the birding action was slow, I decided I would take photographs showing this birding site. 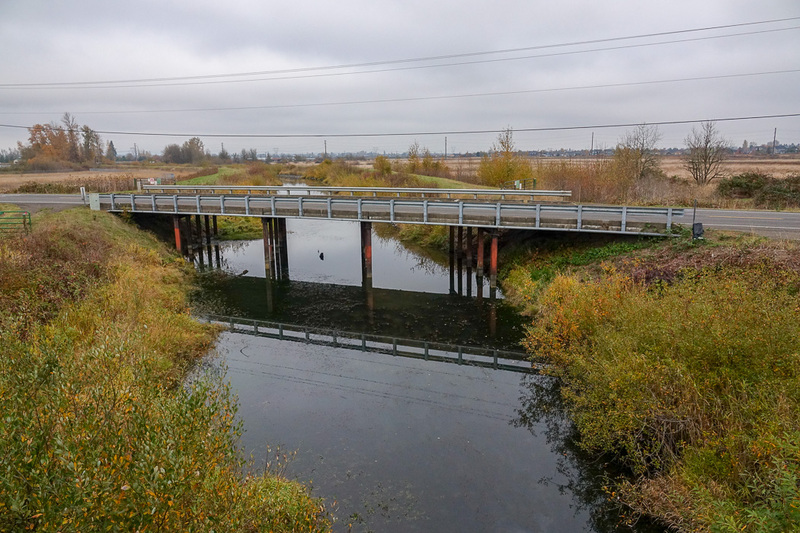 Here is a view looking downstream, of the original channel of amazon creek, which does not flow into Fern Ridge Reservoir. 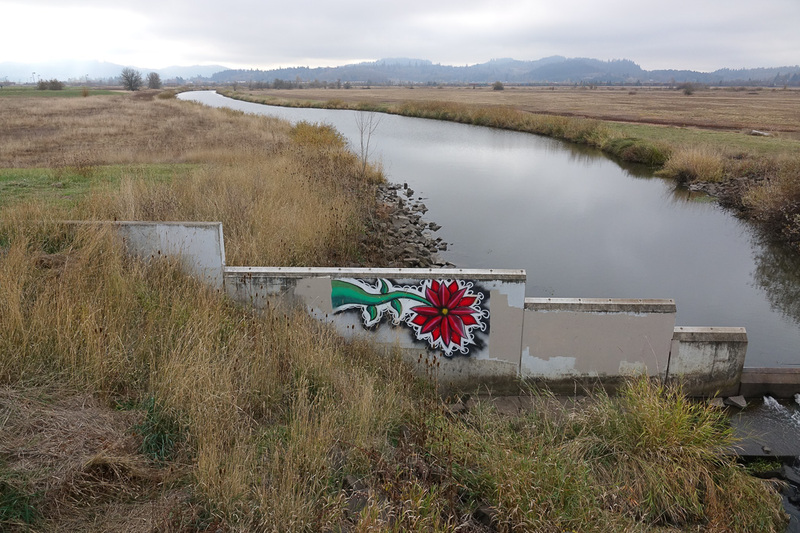 This channel goes quite a few miles through farm land and empties into the Long Tom River near the town of Monroe. The road you see crossing the creek is Royal Ave. People from the Long Tom Watershed Council told me that the early settlers named the Amazon creek after the Amazon river, because when our creek would flood in those days before the dams were built, our amazon creek would flood over a very wide expanse of the valley. Here is a view looking upstream along the same channel. When water flows are low, most of the water goes down this channel. 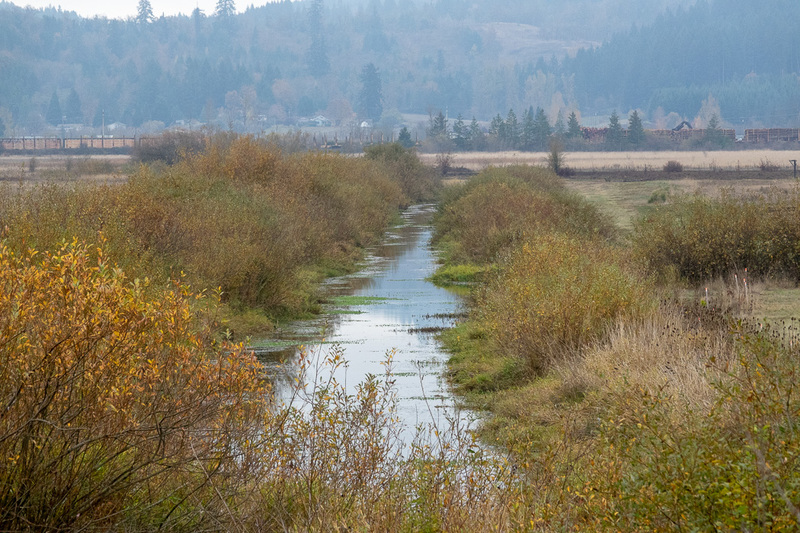 This other stream flows into Fern Ridge Reservoir. We are looking upstream. Within this park this channel is back in a fairly natural state. Outside the park both upstream and downstream, this is the more "channeled-to-prevent-flooding" stream which carries lots of water out of south Eugene This channel carries more water when there is lots of run-off from rain. To the west of both channels, this area is usually pretty wet. 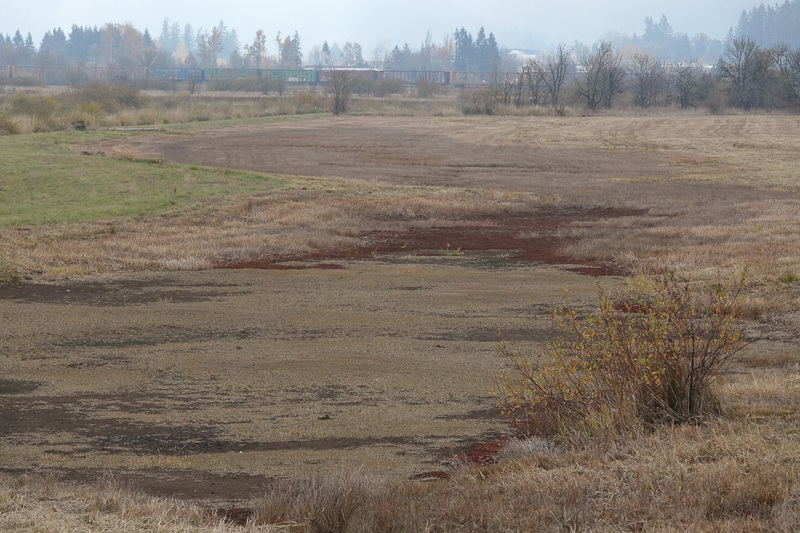 Due to our current drought, some wetlands are not so wet. Even further west of the channels, a controlled burn was carried out not too long ago this Summer. 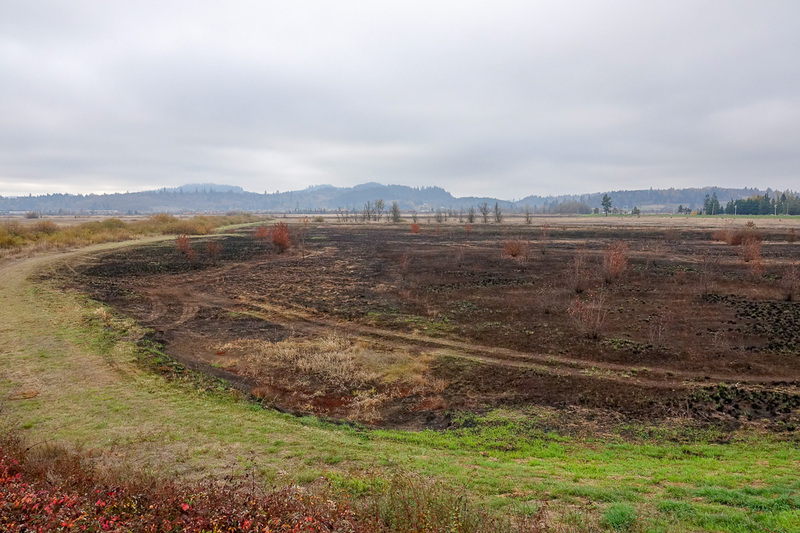 This is near the corner of Greenhill and Royal Ave roads, which is the northwest corner of Meadowlark Prairie. Some of us enjoyed this bright beam of sunlight. For me it was reminiscent of a very special event. When I first moved to this area from Corvallis in 1977 or 78, I lived in a big farm house on Alvadore road one mile from Fern Ridge dam. 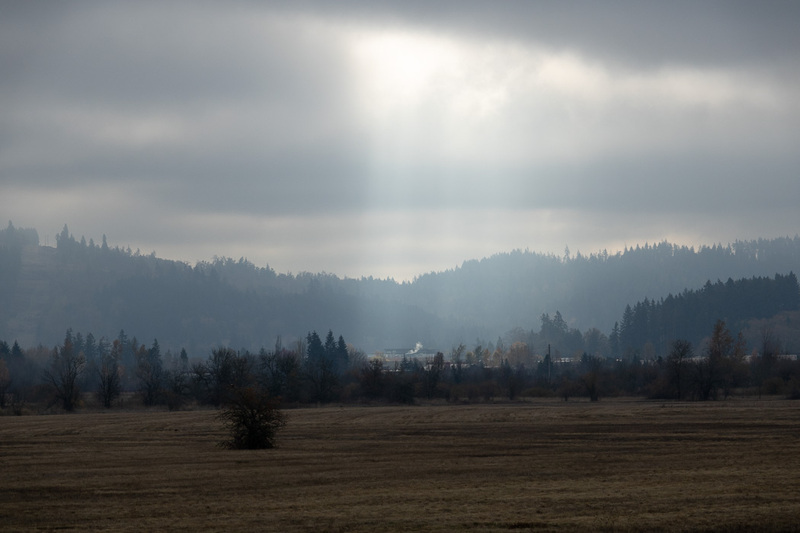 The first time I walked to the reservoir to look for what were then called "Whistling Swans", it was a dreary cloudy day like this one, and there was one bright beam of sunlight just as in this photo only narrower, more focused. However, it was shining on the reservoir - on the water. The spot it was illuminating was a flock of a hundred or so Whistling Swans. Imagine how brilliant those white swans looked with one beam of sunlight shining on them that way. It was an unforgettable experience. It was one of a very few birding experiences where I felt God was sitting on my shoulder. Then we had more distant Raptors. But we slowly worked our way along the curved trail (heading Southeast) and got closer to some of the action. This is also a Red-tailed Hawk. 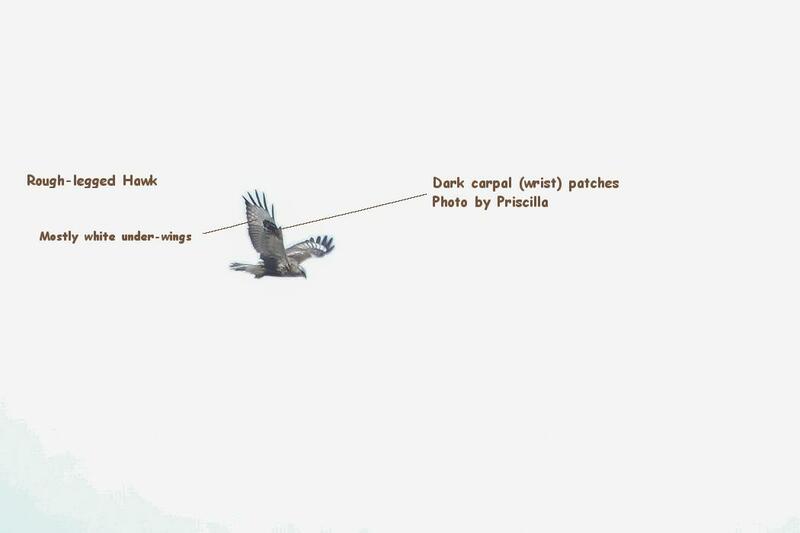 The white breast and dark "belly-band" are fairly reliable indicators for the most common variety of Red-tailed Hawk that we get in the valley, combined with the dark head - (because a rough-legged Hawk might have the white breast and dark belly-band too, differing in it having a white head too, with dark vertical streaks scattered over head and upper breast. I heard Geese calling faintly in the distance. They sounded high pitched like Cacklers. 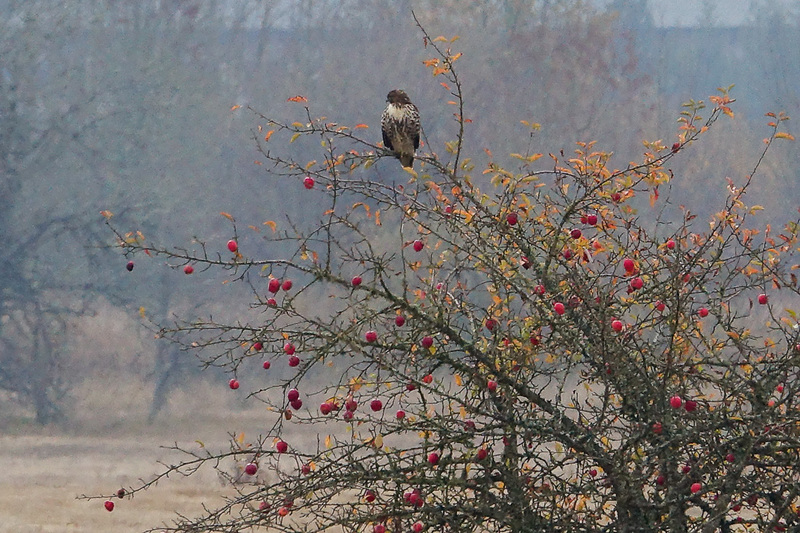 I spotted them, or so I thought, up high in a foggy sky. I recall seeing a set of tiny dark spots in the sky. But when I zoomed my camera in, the geese I was looking at turned out to be ... not geese. 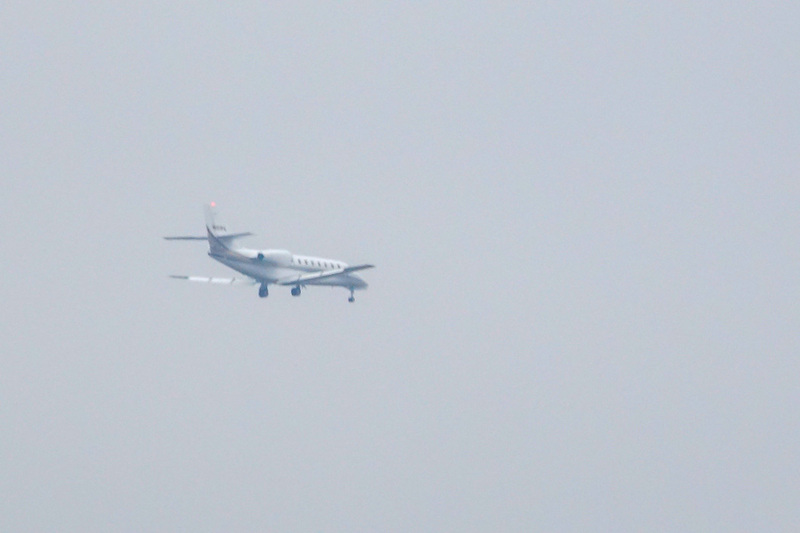 Maybe the spots I saw were the plane windows. Or maybe by the time I got my camera to focus the Geese had moved and the plane had flown into that patch of sky. I know I wasn't just seeing "floaters" because I'm very familiar with them. If you don't know what floaters are, just be grateful. Don had gone ahead of the group on the bike path, and took this photo of some of us back on one of the bridges. 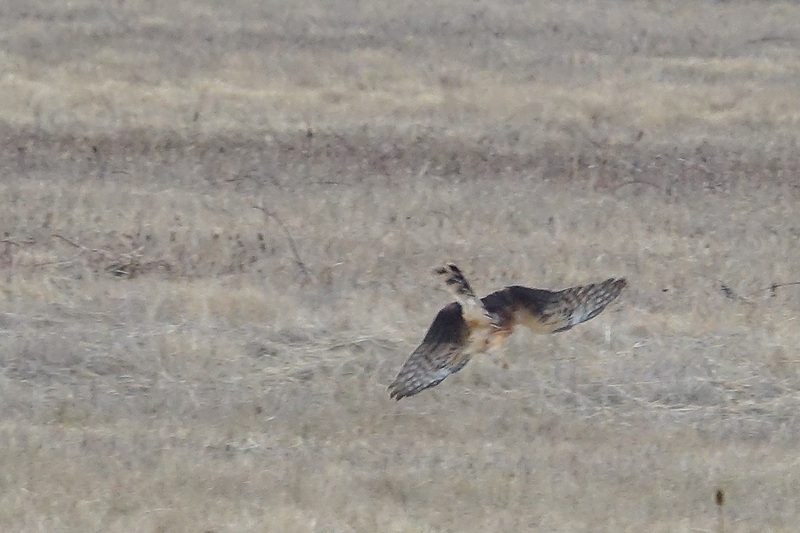 A lot of the action we had was provided by a Northern Harrier which was actively feeding in the fields. 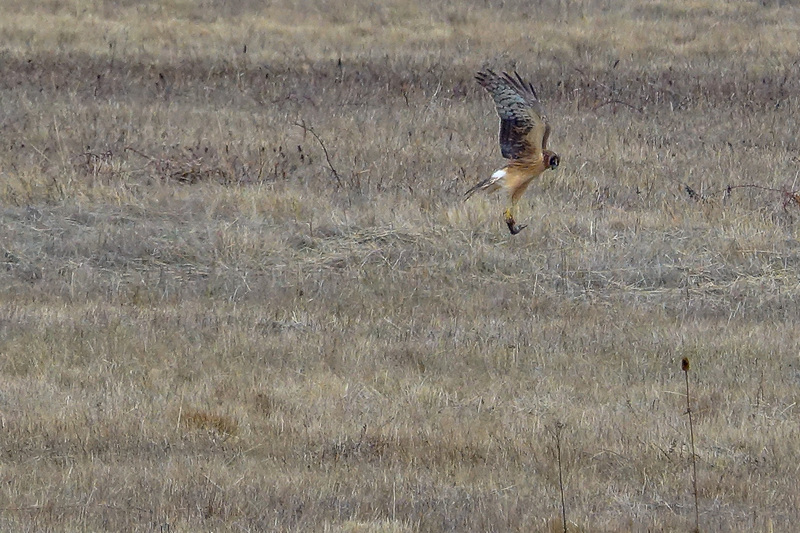 It was while the Northern Harrier was entertaining us that some folks caught sight of another hawk in the sky above the same field. In binoculars it looked about like this next photo. THERE IS A DIFFERENCE BETWEEEN A WHITE RUMP PATCH AND A WHITE AREA ON THE BASE OF THE TAIL. The bird we were looking at had a tail which was mostly white, from its base down to a wide dark terminal band. It did not in fact have a white rump patch. We only encounter a Raptor with a white tail like this during the Winter, when Rough-legged Hawks spend their Winter months down here with us. 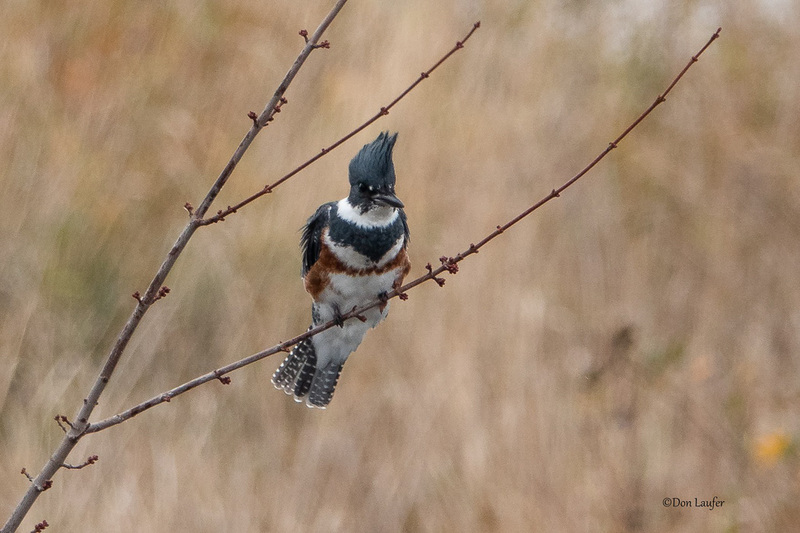 When I looked at this bird, I asked immediately, "What about the white head?" Someone else said yes they were wondering about that too. Harriers don't have a white head. 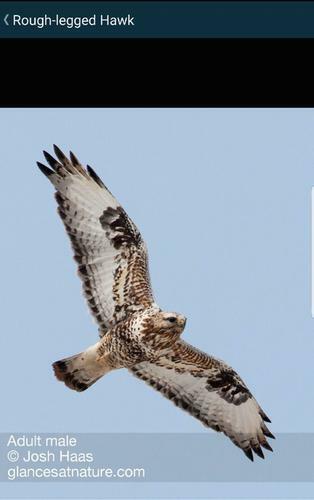 But the rather uncommon Rough-legged Hawk does! 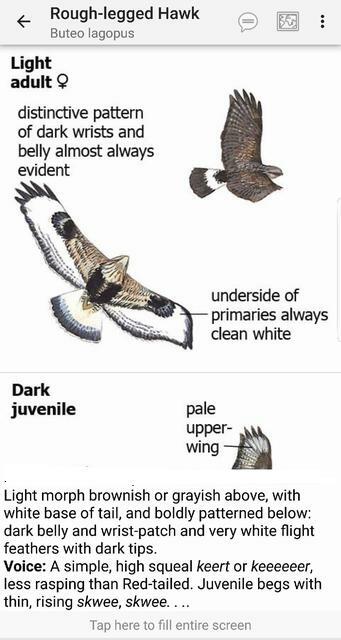 Both adult male and female Rough-legged Hawks have white heads with the white extending down to mid-breast and lots of dark (chocolate brown) streaks on head and breast. I should clarify that it is the much more often seen light morph R.L Hawk which has these streaked white features. The extremely uncommon dark morph, is almost entirely dark above, but the under-wings have lots of lighter color primaries. The underside of the tail has extensive white from base to terminal band but this is not on the top side of the tail. One could say, I think, there are two kinds of field marks, the kind that conclusively identify a species, (DIAGNOTIC FIELD MARKS), and the kind that suggest or are consistent with a certain species but are not by themselves conclusive evidence of that species. The latter type field marks are more common. A notorious example; dark belly-bands don't necessarily make a Red-tail Hawk. 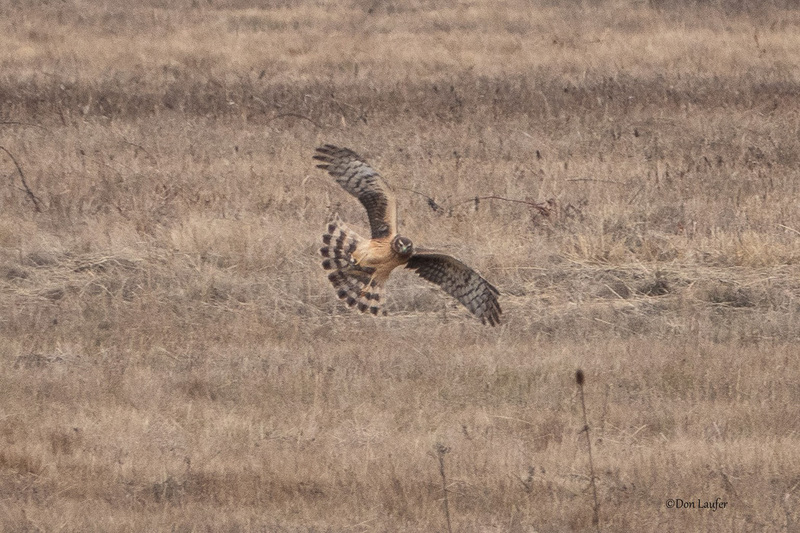 The white rump patch of a Northern Harrier is DIAGNOSTIC, However, one must differentiate between white on the base of the tail and a white rump patch. . We do not often encounter Raptors with the white tail-base, so we easily forget to watch for whether the white is a rump patch or white on the tail itself. BOGS first saw a dark morph on a Finley trip in 2013, on Valentine's Day. 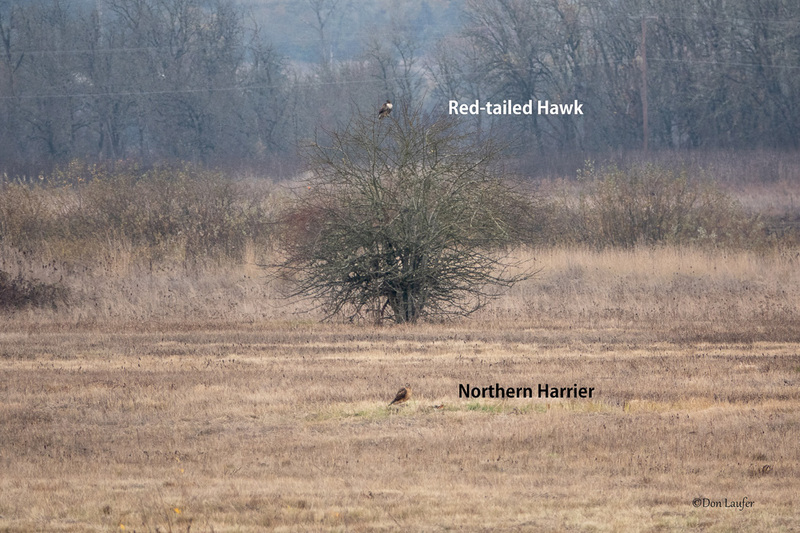 In subsequent years, a dark morph RL Hawk has again been seen repeatedly at the same place nearly every Winter - at the North Prairie Overlook - near the northeast corner of Finley Refuge. 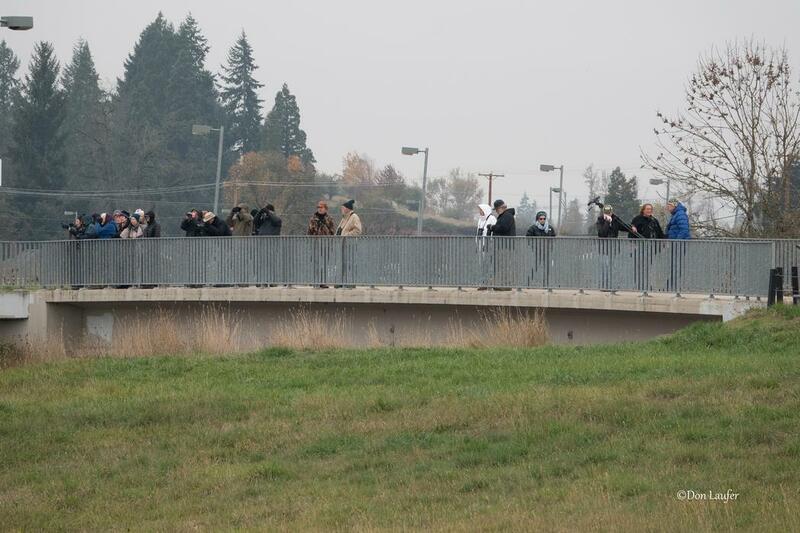 I just learned yesterday that some birders who frequent Finley Refuge have nicknamed the R.L. Hawk, "Chip" and it has been seen this year. 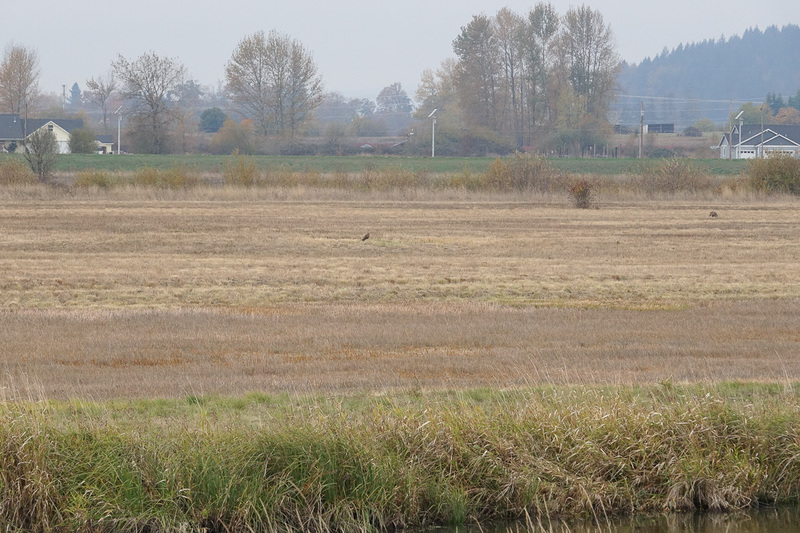 But getting back to our dark morph sighting on Feb. 14, 2013; at first, we decided it was a Golden Eagle. After much discussion over the next days, posting of photos to OBOL, more discussion and more review of photos, we realized there may indeed have been a Golden Eagle there because Steve and Janet Naylor saw it. 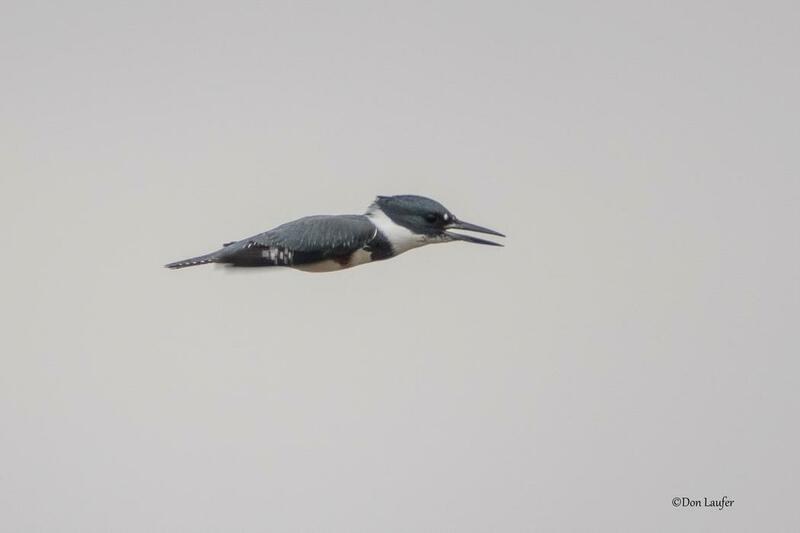 Steve saw it take flight. But there was also a Prairie Falcon which flew over us, and then there was the Dark Morph Rough-legged Hawk which I had photographed. Some of the confusion resulted from the difficulties I had getting my camera to focus on what turned out to be the dark morph R.L. Hawk. 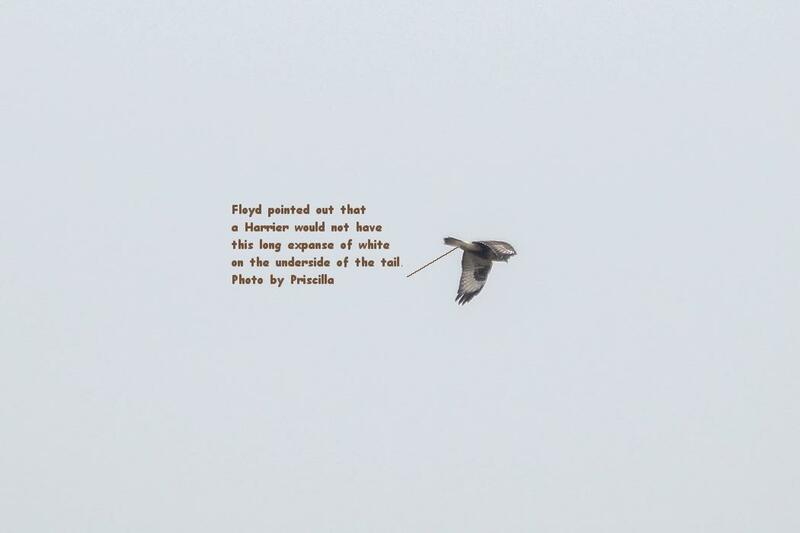 But much of the confusion was due to the fact that three different bird species were flying high overhead and different people were watching different birds. The action took place quickly over a short time so most people didn't know there were three species up there. Myself, I was only aware of one - the one I was trying to get my camera to focus on. 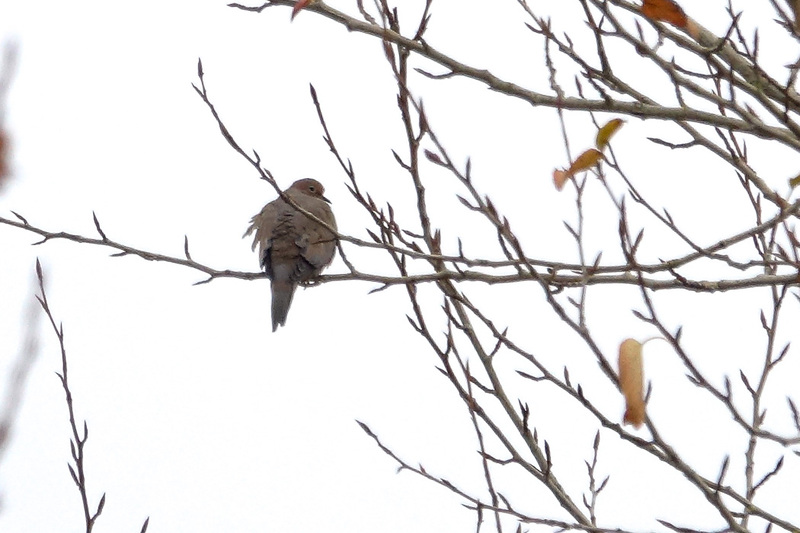 But I ended up with photos of two different species, thinking at the time that they were the same bird. 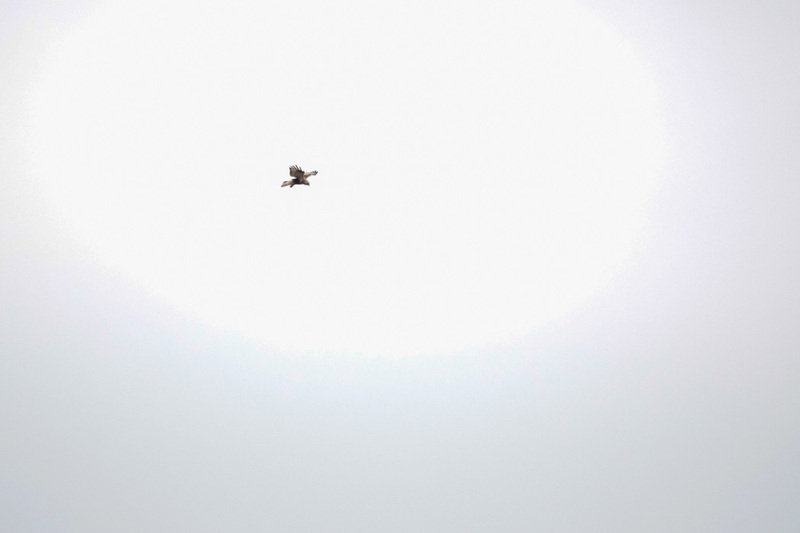 I got a decent photos of the departing Prairie Falcon. 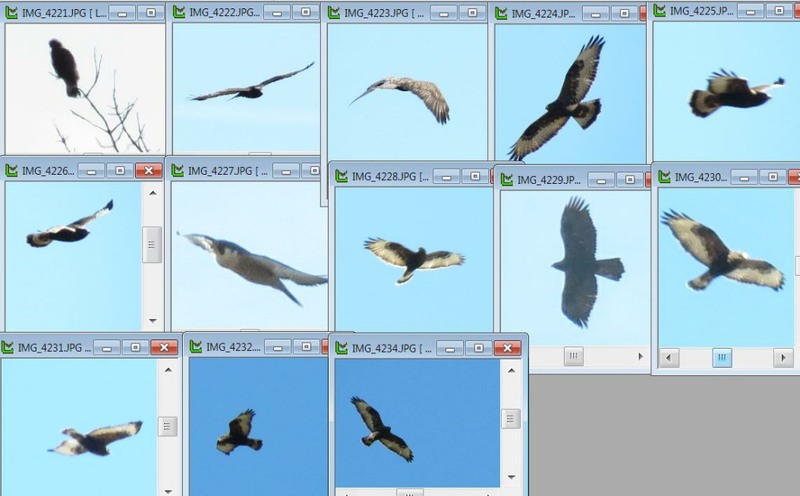 Here's all 12 photographs taken one right after the other - of the three birds involved. 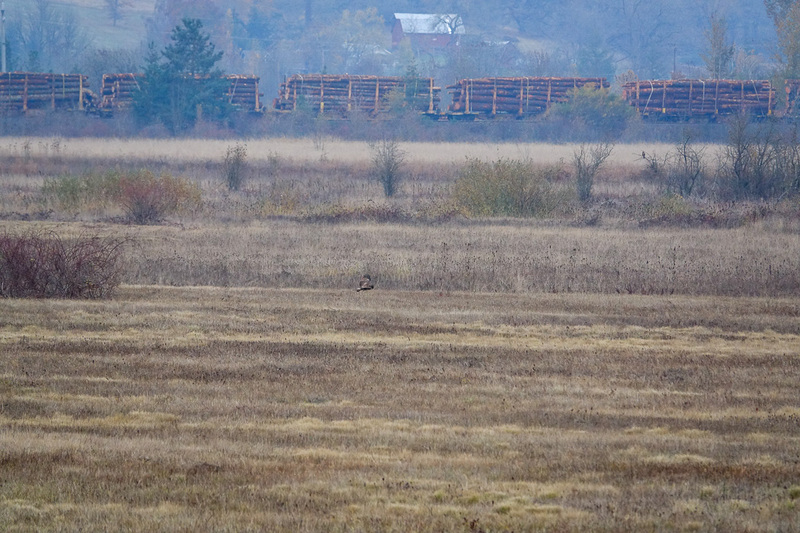 Image #4227 is the Prairie Falcon. The first image might be the Golden Eagle perched before taking flight. 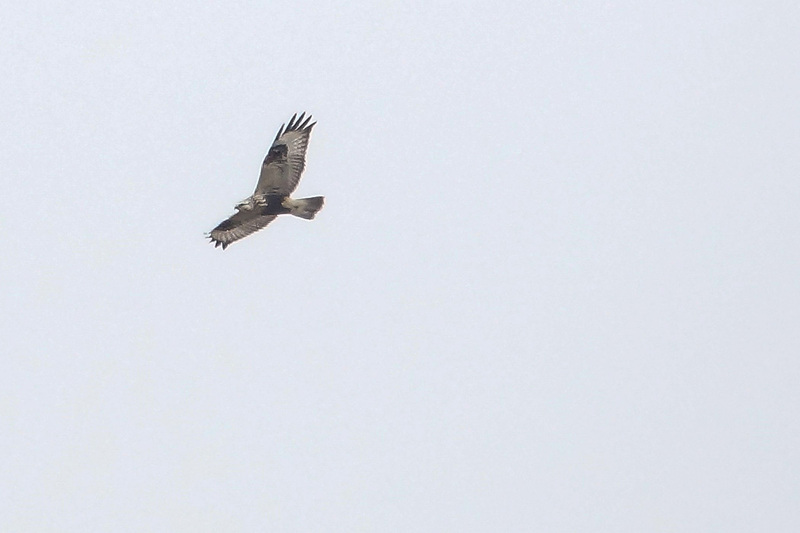 All the rest of the images are the dark morph Rough-legged Hawk. And here's the entire slide show from that Finley trip. I had to fix it because the photos were missing for some reason. They are all there now. it revealed itself further by both kiting and hovering. The former involved no wing-flapping and staying stationary riding the wind like a kite; while the latter is flapping and staying in one place as one often sees American Kestrels doing. 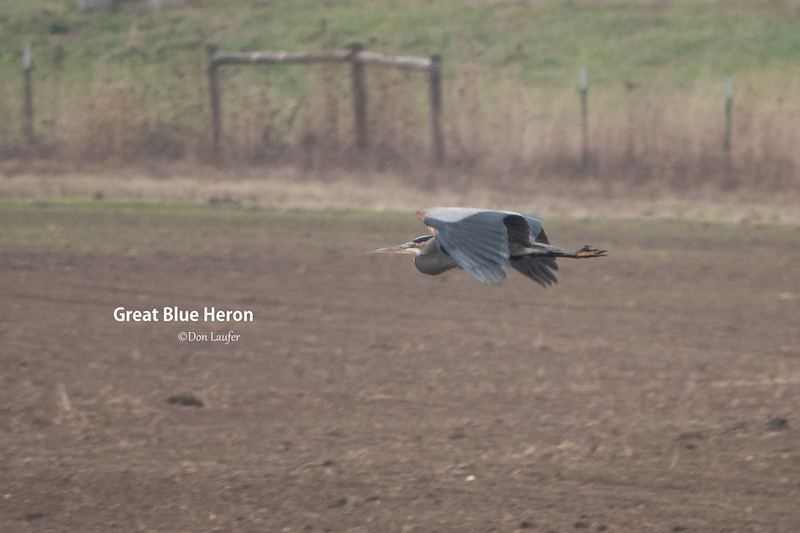 We had a couple Great Blue Herons too. One flew over the path behind us and the other was hanging out on the bank of one of the channels when we got back there. 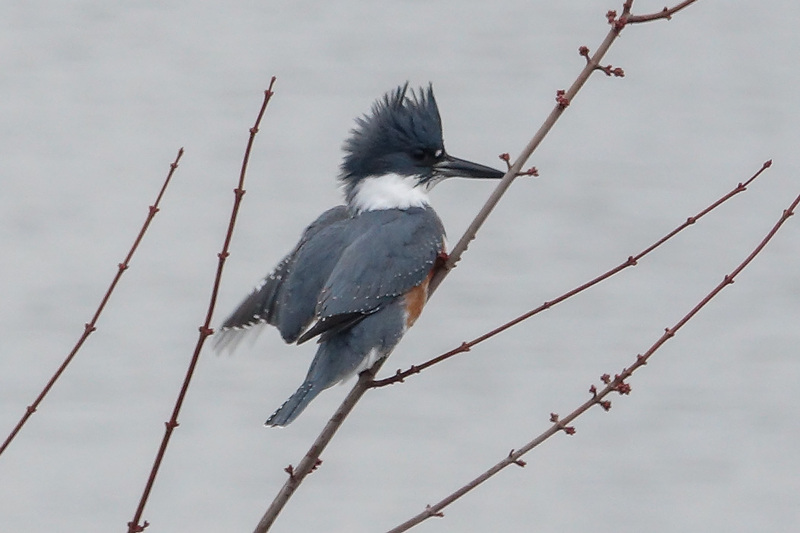 Once again Janet opened her birding guides and found that male Belted Kingfishers have none of the rufous color. Females do, including a full rufous band across the breast, below the dark blue bib/band. 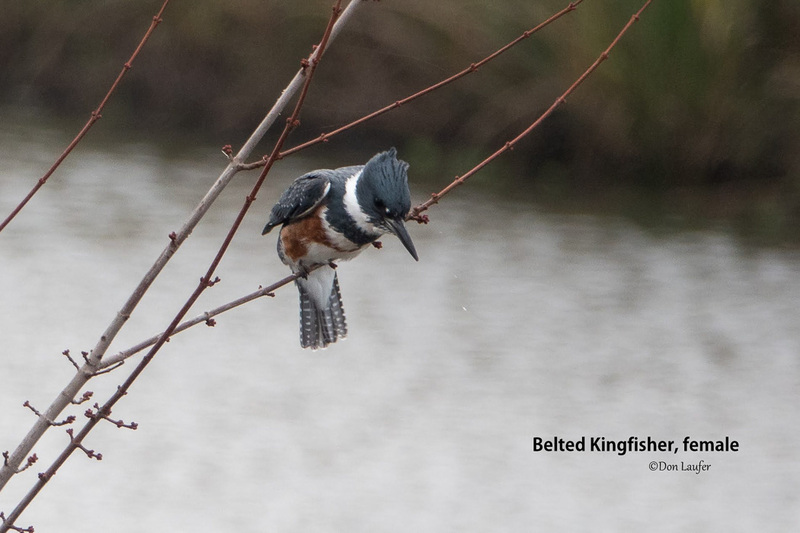 Juvenile Kingfishers have rufous along the flanks like an adult female but have no 2nd band across the breast. 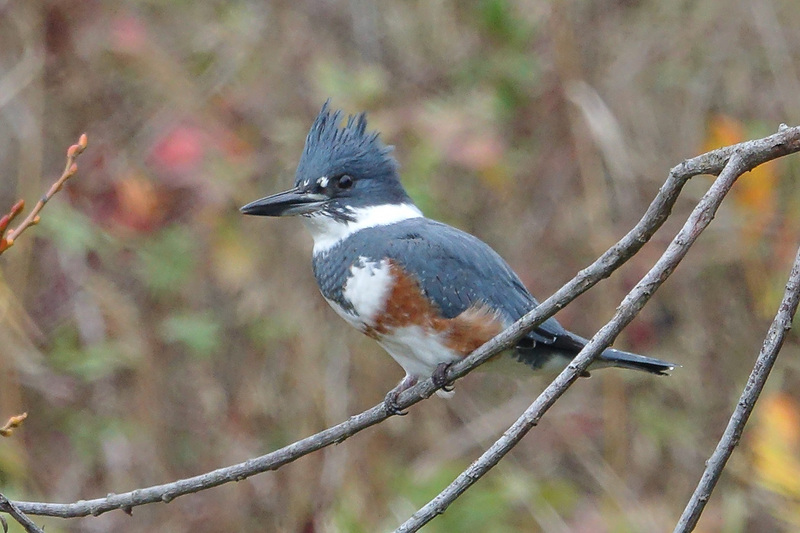 The dark blue bib/band has rufous specks in it (through September according to Sibley). Our bird looks like an adult female, or since this is already November, it could be a first year bird already looking like an adult. This photo might well serve as a final salute to the Kingfisher as it appears to take a bow after its magnificent performance! There are many photos in the slideshow which are not included in this written report. I recommend watching the slideshow.